Medical miracles never cease to amaze! (CNN)An artificial womb resembling a plastic bag has been used to keep premature lambs alive for four weeks outside of their own mothers’ wombs and could one day be applied to premature babies. 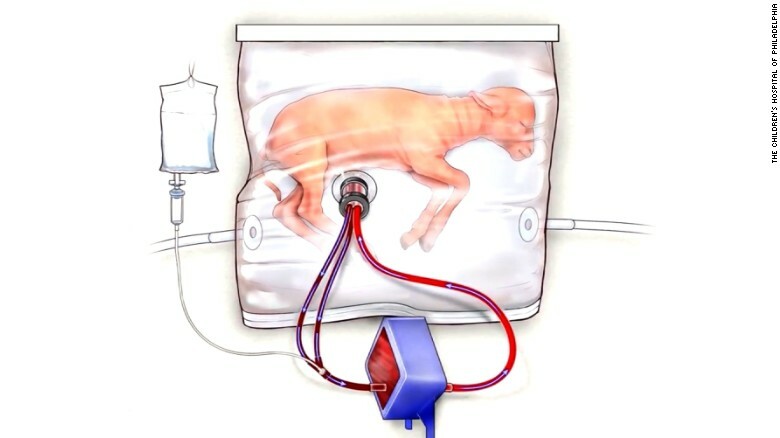 The sealed bag, made of polythene, contains amniotic fluid to provide all the nutrients and protection needed for growth and an interface delivering oxygen just as an umbilical cord would, and exchanging gases just like a placenta. The system works to mimic the environment of a natural womb, and the team hopes to one day adapt the technology for use with premature babies. “We’ve developed a system that, as closely as possible, reproduces the environment of the womb and replaces the function of the placenta,” said Dr. Alan Flake, a fetal surgeon and director of the Center for Fetal Research in the Center for Fetal Diagnosis and Treatment at Children’s Hospital of Philadelphia who led the research, published Tuesday. One in 10 US births is premature (younger than 37 weeks gestational age), according to the team. And about 30,000 per year are critically preterm, meaning they are born younger than 26 weeks. The average human gestation period is 40 weeks. Flake adds that this level of extreme prematurity is the leading cause of infant mortality and morbidity in the US, accounting for a third of all infant deaths and half of all cases of cerebral palsy attributed to prematurity. The Royal College of Obstetricians and Gynecologists in the UK also reports poor survival of babies born at gestations below 24 weeks, despite great progress in neonatal care. Globally, more than one in 10 pregnancies will end in preterm birth. In babies born preterm, the chance of survival at less than 23 weeks is almost zero, while at 23 weeks it is 15%, at 24 weeks 55% and at 25 weeks about 80%, according to UK maternal and fetal research charity Tommy’s. Flake’s team hopes its new system may improve survival rates among this group of babies in the future but acknowledges that it will take at least a decade. To show the potential of their system, the team worked with five premature lambs aged 105 to 111 days, as they are developmentally similar to a human fetus at 23 weeks, Flake said. They also used three lambs that were slightly more mature, age 115 to 120 days. “We supported these lambs in a very stable fashion for up to four weeks,” he said. “Fluid is very important in terms of fetal lung development,” Flake said. It also helps insulate and protect a fetus from infection and maintains temperature, pressure and light. “It continuously exchanges amniotic fluid … in the same way that amniotic fluid is exchanged in the uterus,” he said at a press briefing. And the team’s efforts were successful, with the lambs showing normal circulation, blood pressure, metabolic processing, growth, lung development and brain development after four weeks inside the artificial womb. The team at Children’s Hospital now plan to refine the system by downsizing it for human infants who are one-third the size of the lambs, as well as developing the ideal amniotic fluid for human use. “This is a really attractive concept, and this study is a very important step forward. There are still huge challenges to refine the technique, to make good results more consistent and eventually to compare outcomes with current neonatal intensive care strategies,” said Colin Duncan, professor of reproductive medicine and science at the University of Edinburgh, who was not involved in the research. “This treatment will not enter the clinic anytime soon,” Duncan added, citing the example of steroid injections for women at risk of delivering a premature baby now used to help accelerate fetal lung development, which was discovered using sheep models.